A sunny autumn afternoon saw over 250 people turned out in Wellington to protest against , the now, three years of war and occupation in Iraq. 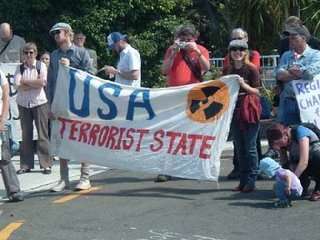 People of all ages, from babies to grannies, were present for a thoughtful but relaxed demonstration marking the third anniversary of the US invasion. Speakers of all ages emphasised the need to halt the US global onslaught on basic freedoms and human rights.Local techheads "geeks 4 peace" showed that you don't have to be cool to be against the war. "We believe our message "1001 11011 010101 00011 0001 0011110 01111" speaks for itself" said one open_source_activist. "We see the right to run your own lives as no less important than the right to run your own OS".Unfortunately a moment of street theatre late in the day prompted the remaining three youthful police officers to spring into action. A hasty arrest engendered an atmosphere of tension which then became compounded by extra officers turning up and commencing much pushing, shoving and threatening behaviour. Police then individually launched a seemingly random series of heavy-handed arrests resulting in two people seeking medical attention. " I think if these young fellows had had a more senior officer present none of this would have happened" one veteran protestor remarked. 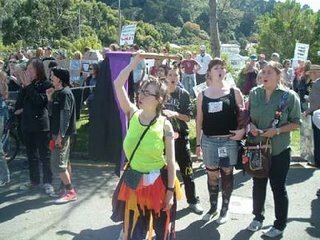 "They just seemed to be lacking a bit of discipline"Organisers asked that the earlier peaceful spirit of the day not be overshadowed by the police violence. "We understand that as officers of the state they are obliged to use arbitrary and disproportionate violence whenever the state deems it appropriate" one commented. "We would ask that people instead think of the brutality occuring daily, on a far greater scale, in Iraq, Israel and Afghanistan and put their efforts in that direction" he said. From the photos, Wellington looks a lot like Eugene, Oregon here in the States.